On 22 September 2015, Greenpeace Southeast Asia (Philippines), thirteen other non-profit organizations, disaster survivors, and notable individuals, with the support of tens of thousands of Filipinos, filed a petition before the Commission on Human Rights of the Philippines (CHR) against the world’s largest investor-owned carbon and cement producers, known as the ‘Carbon Majors’, claiming that they should be held accountable for contributing to climate change and ocean acidification impacts which infringed the basic human rights of Filipinos. The petitioners implored the CHR to use its powers to investigate, recommend, and monitor the Carbon Majors’ responsibility for the role of climate change impacts in human rights violations or threats thereof. After receiving comments and answers from some of the forty-seven (47) respondents summoned in late 2016, international experts submitted various amicus curiae briefs and letters to help the CHR determine its authority to investigate. The petitioners then filed their Consolidated Reply in February 2017, to which some of the respondents filed their respective Rejoinders. The CHR conducted preliminary visits to impacted communities and held a first conference of the parties to discuss facts, issues, witnesses, and some evidence as part of its National Inquiry. Since holding its first public hearings in the Philippines in late March 2018, the CHR has had a busy year: there were 12 hearings throughout 2018, 26 community witnesses testified, and 52 experts gave evidence. Contributions to the proceedings by organizations, scholars, and scientists can be found on the website of the Business and Human Rights Resources Center. Inquiry Hearings were also held in New York and London in September and November, respectively, giving ample opportunity for respondents to state their case. The major legal and scientific hurdle the petitioners must overcome is proving causation or contribution. Expert testimony and evidence from Richard Heede, the Director of the Climate Accountability Institute, attributes the majority of cumulative CO2 and methane emissions since the Industrial Revolution to the Carbon Majors. These findings are important because they show that the Carbon Majors produced and profited from a significant portion of the emissions that ultimately drive climate change. According to the Intergovernmental Panel on Climate Change (IPCC), continued emissions of greenhouse gases “will cause further warming and long-lasting changes in all components of the climate system, increasing the likelihood of severe, pervasive, and irreversible impacts for people and ecosystems.” Brenda Ekwurzel, the director of climate science at the Union of Concerned Scientists testified about how advances in attribution science have matured enough that courts should be prepared to accept the causal link between specific emissions by fossil fuel producers and increased risk of and vulnerability to climate change. 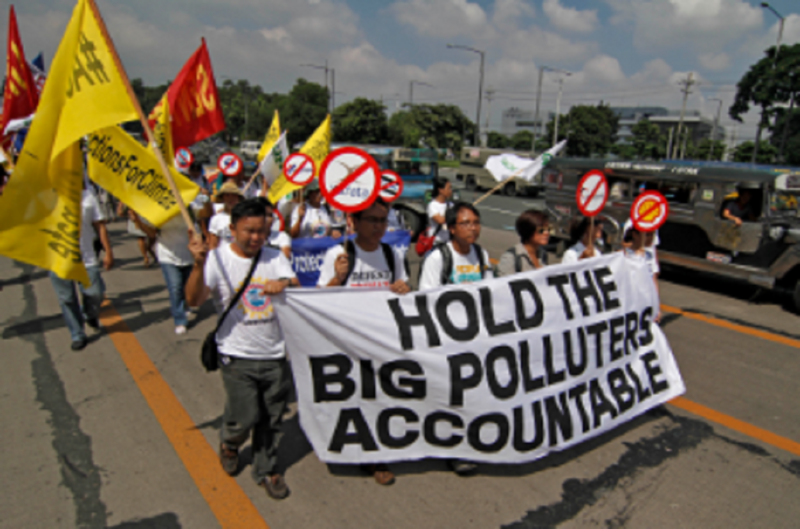 The petitioners claim that the Carbon Majors’ contribution to global climate change, failure to curb emissions despite capacity to do so, knowledge of the harm caused, and involvement in attempts to sow doubt about climate science and undermine action, violate the human rights of all Filipinos to life, mental and physical health, food, water, sanitation, adequate housing, and self-determination. Showing that national human rights inquiries are helpful in addressing transboundary issues with extraterritorial obligations and can overcome jurisdictional challenges. The CHR has the potential to shift how the law understands corporate responsibility for climate change by highlighting the role fossil fuel companies have played in creating the climate crisis. If successful, the petitioners could help push jurisdictions around the world to start holding coal, oil, gas, and cement companies accountable for their contributions to climate change and forcing them to act to prevent further harm. Climate change lawsuits are being filed all over the world, with 654 cases filed in the United States as of March 2017 and over 230 cases in other countries. It is clear that climate change lawsuits are here to stay, at least until governments and corporations alike show leadership and responsibility in tackling the climate crisis.